Still on fall out from the recent toddler party (yes, five 3 year old boys make a lot of noise and chaos) and still on recipe fall out too. We’ve recently discovered that the toddler is rather partial to what I called cornflake crackles and what, apparently, the internet calls ‘honey joys’. Really? I have never heard them called this. 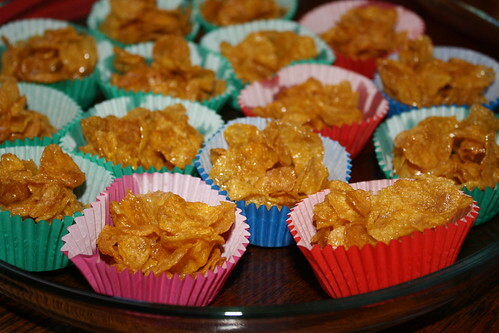 I’m not 100% sure what I called them as a small child (I have a recollection I wasn’t a big fan) but cornflake crackle was what came to mind. I took a vox pop at the party and while a few parents were like me and had no idea what they should be called, at least one was adamant they were ‘honey joys’. Nomenclature aside – I’ve discovered I quite like these now. They are very easy to make and, with a small amount of supervision (because honey, butter and sugar is going to get hot!) they have potential for children who want to help out. Another bonus is that they require no special kit and they are both quick and quiet to make. This is ideal for anyone with small children as they can be made after children have gone to bed and, being so quick, they don’t take up your whole evening. They keep perfectly well being made a day ahead. I initially tried making a half batch (scared off by Kellogg’s saying 24 servings) but found that it only made about 9 (maybe my cupcake tray is just too big) so unless you’re catering for a very small group, bite the bullet and make a full batch. In a pan, melt the butter, honey and sugar together and heat until it starts to froth a little. Remove from the heat and gently stir through the cornflakes. You need to be cautious because the sugar mixture will be very hot but you also need to work quite quickly because as it cools down it will be harder to work with. Spoon the cornflakes into the patty cases and cook in the oven for 10 minutes. Will keep for a day or so. &frac13; means how much caster sugar? That should read “1/3 cup”. It seems to be broken in Internet Explorer and I will look into how to fix that. Thank you for pointing it out!